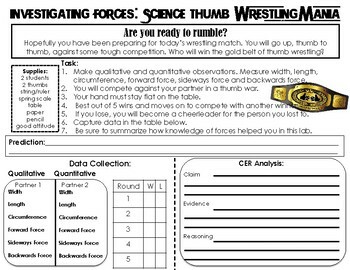 Students investigate the concepts of balanced and unbalanced forces by participating in a thumb wrestling competition. I like to put the winners bracket on the board. 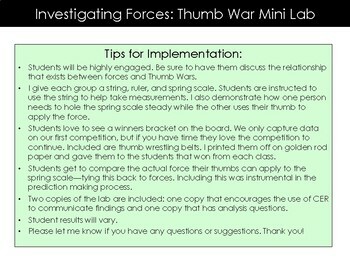 During this mini lab, students will gather qualitative and quantitative data. Students will predict and write a CER upon completion. 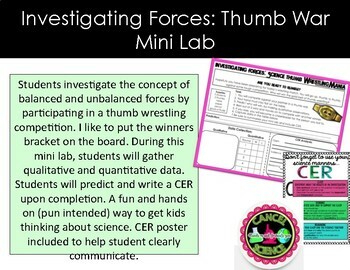 A fun and hands on (pun intended) way to get kids thinking about science. CER poster included to help student clearly communicate.